Extreme Thermostable SSB is a single-stranded DNA binding protein isolated from a hyperthermophilic microorganism. It remains fully active after incubation at 95°C for up to 60 minutes. Due to its ability to withstand extremely high temperature environments, ET SSB can be used in applications that require extremely high temperature conditions, such as nucleic acid amplification and sequencing. 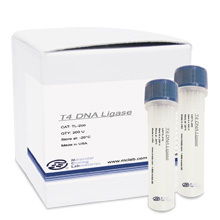 Purified from an E. coli strain that overexpresses the SSB gene isolated from a hyperthermophilic microorganism. 1. Baugh, L. R., Hill, A. A., Brown, E. L. & Hunter, C. P. (2001) Nucleic Acids Res 29, E29. 2. Villalva, C., Touriol, C., Seurat, P., Trempat, P., Delsol, G. & Brousset, P. (2001) Biotechniques 31, 81-3, 86. 3. Schwarz, K., Hansen-Hagge, T. & Bartram, C. (1990) Nucleic Acids Res 18, 1079. 4. Chou, Q. (1992) Nucleic Acids Res 20, 4371. 5. Oshima, R. G. (1992) Biotechniques 13, 188. 6. Rapley, R. (1994) Mol Biotechnol 2, 295-8. 7. Olszewski, M., Rebala, K., Szczerkowska, Z. & Kur, J. (2005) Mol Cell Probes 19, 203-5. 8. Myers, T. W. & Romano, L. J. (1988) J Biol Chem 263, 17006-15. 9. Delius, H., Mantell, N. J. & Alberts, B. (1972) J Mol Biol 67, 341-50. 10. Reddy, M. S., Vaze, M. B., Madhusudan, K. & Muniyappa, K. (2000) Biochemistry 39, 14250-62. 11. West, S. C., Cassuto, E. & Howard-Flanders, P. (1982) Mol Gen Genet 186, 333-8.